with the family and returning on the 2nd. Hoping to get a few runs in. By the way, another milestone was reached yesterday. 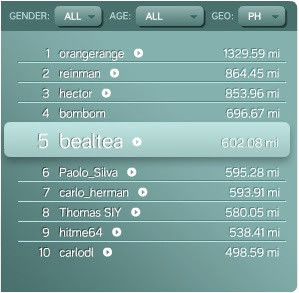 I logged 600+ miles on Nike+, and reached the Top 5 in Distance in the Philippines! :-) What a way to end the year, eh? and lastly, to sleep more! Pretty ambitious, eh? 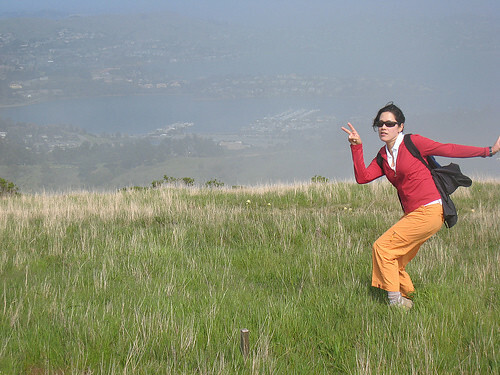 I'm not sure whether listing my resolutions on this blog is a good idea, but if it'll keep me on track, then so be it. So I went for a swim the other day. Did my usual 60 laps on a 25 meter pool. I was highly distracted. By these two teenagers leaning against the pool divider to my right. They were making out. I'm not a prude, but how can I not notice, when they were encroaching my lane. With legs wrapped around each other and some serious groping going on! Come on people, some discretion please. Plus, this is a 6 lane pool, it's empty except for the three of us, why pick the lane right next to mine? And Lifeguard, hellooow! Isn't part of your job description to discourage this kind of thing?!? ... drinking. Wine overflowed at last night's affair. We were forewarned that a surprise awaited us. It was cocktail hour at the grounds of Meralco! Graced for a while, by the presence of the chairman himself. We were an intimate party of ten, cozy in an outdoor shed lit with a thousand lights. There was a full bar, liveried staff, a dressed table, crystal ware... Our hosts do know how to entertain. Even an impromptu serenade by one dashing man. If you haven't seen Meralco at this time of the year, do try to see their display. It's simply amazing, they've created a whole village made up of copper wire and lights! Dinner followed several hours later, back at the home of our gracious host. The food, the friends, the joy this holiday season, so many reasons to be thankful for. But anyway, I woke up today, highly dehydrated from last night's merriment. I can't even think about running today. Or drinking another glass of wine, ever! A good resolution for next year ~ everything in moderation! making :: presents using scraps and found items ~ I'm doing my bit to save the world! Pictures to follow once gifts are distributed. 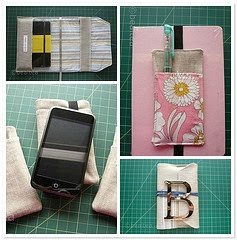 UPDATE: Here are some of the stuff I made, a book cover, a pencil sleeve and several iPod Touch cases. No long runs logged over the weekend... very, VERY bad! I swear to get one in this weekend. I did an easy 4mi walk/jog with a friend on Sunday though. This friend of mine just started running several weeks ago. She did quite well, we jogged 5min and walked 2min for an hour. I'm so proud of her, she even reached the "zone" during her last 5min jog! Although she is athletic, I never envisioned her as a runner... (she's an equestrian, was the captain of her high school tennis team, and has dabbled into all sorts of martial arts). From the looks of it, she will be more than just the occasional runner. 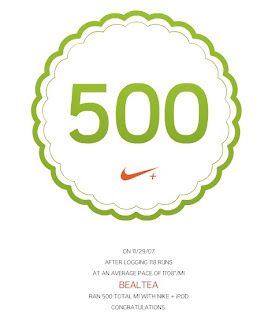 She's outfitted herself with a whole lot of goodies: a 3rd gen iPod Nano, the Nike+ Sports Kit, a pair of Asics running shoes, and a running watch. Now I'm telling her that all she needs are some dri-fit shirts. But she refuses (for now anyway), as she's a 100% cotton shirt kinda girl. Whoever said running was a cheap sport didn't know what he was talking about! There are all sorts of must have running paraphernalia. But seriously, once you've got the gear, that's it, you're done spending. Oh, except for the shoes, which you need to replace every 450-500 miles. As a skier and a diver, I can tell you that running is a bargain. It's not a destination sport, you can run anywhere. You can wear your running shoes even when you're not running ~ you can't do that with fins or ski boots. UPDATE:: 12/26 My friend gave up on Nike+. She ended up buying the Garmin Forerunner 305 today. She's tested it and is happy with it! Because I've been slacking off on my long runs... And also, to counter the deluge of caloric goodness I have, and will be eating, this holiday season. 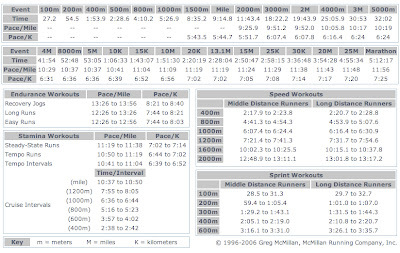 For the most part, I will be sticking with Hal Higdon's Marathon Training - Intermediate 1 plan. Just a few minor changes though to accommodate the half marathon. This will be my 2nd race, ever. Hopefully it will indicate whether I'm good and ready to run a full marathon the following month. Subic is 37 days away from now. Yikes! And the Philippine Marathon is 72 days away, double yikes!! Yes! Based on this prediction, I will finish under 5hrs! 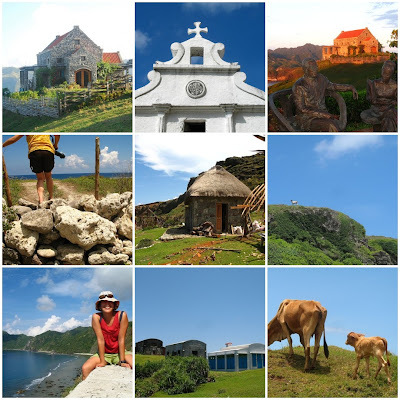 I haven't watched a movie in a long time, so over dinner last night, my cousin, sister-in-law and I all expressed interest in watching the movie, Batanes. Consequently,plans were made to watch it today. I love to run. It's who I am. There are days though when I don't feel like running. Sometimes, I try to get out of it, but then I think of the guilt that will follow. And, the zero miles logged for the day. So inevitably I always, though reluctantly, head out the door. I'll take no excuses from me. Speaking of excuses, I came across Dread Pirate Rackham's blog recently, and I liked what she had to say about it. ...It seemed like I was surrounded by people who said "running? that's crazy" or "good for you, I can't run because of [insert X, Y, or Z lame/semi lame excuse]." Everybody has an excuse. Or a story. Or a reason they can't. They can't, but I can. What they don't realize is that I'm really no different from them. I can totally relate! She also has her own set of running rules, 27 of them! Check it out here. 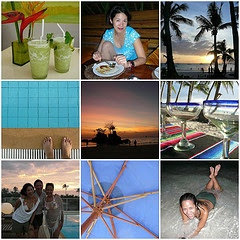 If you like her blog, and are so inclined, vote for her blog as one of the Best Endurance Sports Blog in 2007 here. 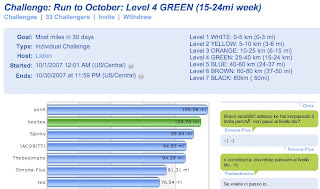 NOTE: Mileage listed above was meant for Week 8, but because I didn't follow it, I am repeating it for Week 9. Week 8 was a "light" week for me. Had I stuck to my original training schedule, today's long run would have been 15mi and I would have run a total of 37mi for the week. But I had a lot of concerns, mostly my shins. So I took 3 days off from running, but added strength training and swimming. Now that I have the 1061s, I don't think I need to worry about my shins anymore. But, I will take it easy and make sure to take two days off from running each week. Within a month of getting the Triax, I bought another pair of running shoes, the New Balance WR1061. This shoe is highly rated here and here. A couple of reviewers mentioned though that this shoe is classified as "neutral plus," therefore suited for heavier runners. Uh oh, there is no way you can classify me as heavy. Still, I plunged ahead with the purchase because the selection of women's running shoes in Manila is so limited. Plus, it was on sale! Already, the 1061 is showing promise. I am SO happy to say that after several runs totaling 14.7mi, I haven't felt any pain whatsoever! :-) Huh, a shoe really does make a difference. My youngest brother, C and his wife S temporarily moved back home yesterday as they await completion of their unit in Boracay. They plan to spend half their time in Bora and the other half in Manila. Welcome back! AHA! I may just have come to the root of my problem. I recently started using these pair of shoes. Each time my foot hits the ground, these shoes make a loud slapping noise which I can hear through my headphones. So much for buying a shoe voted "Editor's Choice," if it isn't appropriate for you. I'm actually a neutral runner, not an overpronator, and this shoe corrects overpronation. Also on Runner's World, this article Get Healthy Calves and Shins, by Ted Spiker, describes shin splints. Unfortunately, I will be doing less running and more swimming and strength training for the next couple of weeks. Just letting my shins rest a bit. BUT, I'm still very much committed to my training. Quickly flipping through the menu to start my run, my Nano froze :-( Ergo today's run isn't recorded on the Nike+ and Runner+ sites. Per the treadmill, I ran 4.60mi. No major shin pains even though I used my problem shoes. Visited an orthopedic doctor today for a consult on my shins. He thinks it's just strained muscles and too much running. Just to be sure, he asked me to get an AP/Lat xray of my right leg from knee to ankle joint. He didn't ask to see my shoes nor check the way I run. Recommended that I research on stress fracture and compartment syndrome. Will get a second opinion from a sports doctor... and also a new pair of running shoes. Did 2 not so easy "easy" runs over the weekend though, for a total of 8.2mi. Again experienced some shin problems on my right leg. Did the walk/run bit as my shins were way too tight and I was in pain. I need to get this checked before it gets out of control. Shoes used: my old Salomons. Just as I’m getting serious with my marathon training, it will be difficult to keep the momentum going due to upcoming trips. 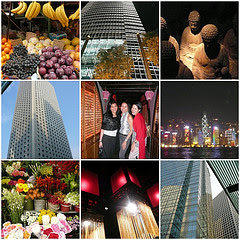 As much as I love traveling and vacations, the next few trips will be done somewhat reluctantly. 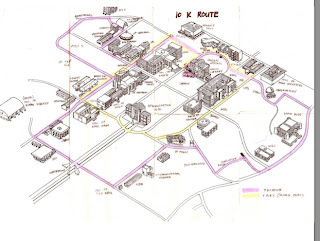 I need to find time and some interesting routes to run while away. can't remember exactly where I swiped this map from, but I believe it's from some U.P. Mountaineering member's blog. Today's long 9.95mi run was done around the U.P. oval. Grabbed a cab at 5:15am and headed to the university to run with J and Doc A. We started out fast at a 9:28pa. This being my first time running with them, I didn't want to hold them back. So by mile 5, I urged them to go ahead without me while I run at a much slower pace. Them being the gentlemen they are, said no, so we settled to a more manageable pace of 10:45. 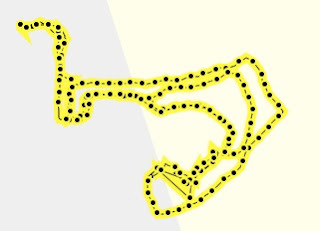 It took me 1h53m to circle the outer oval 6.5 times at an average pace of 11:23. Not bad... I completed last week's long 8mi run on the treadmill at an 11:55pa. It was encouraging to hear J say that I've got good form and strides, and more importantly that I will do quite well in the marathon. Not bad for someone who only started running this June, eh? Except for the expensive cab ride (P130! ), it's so much nicer running in U.P than in Ortigas. On Sundays, streets circling the oval are closed to vehicles, there are lots of trees, a big oval you can circle over and over, and lots of runners and bikers to check out. ;-) There were several running groups out there training for the New Balance half marathon to be held in Subic in a couple of weeks. The Runnex group had over 30 members in tow, WOW! That's the way to do train. A few more days until the October Runner+ challenge is over. I should wait for the challenge to end before posting the final results. But when I logged on today, I was ecstatic to note that I'm currently in 2nd place! Can you feel my giddyness?!? ... can't figure out how to rotate this photo. Just got back from a lunch with CG at Santi's Deli. It was so nice to be able to catch up with her, it's just been too long... A lot has happened since I saw her three weeks ago, all of it good things, and I'm glad it's happening to her. I'm crossing my fingers that the man from Spain is the "one" and that all will fall into place. You give us hope, CG. I got giddy hearing her stories. In a way, the rush I get from running is similar to spending time with someone you're attracted to, during the early stages. BUT without the insecurities of is he or is he not feeling the same way about me as I do him. Anyway, since I'm without the "one," I'm glad I have running as an outlet, a low maintenance substitute to being in love. in the Philippines! YEAH, I've been working long and hard for what I once thought an unattainable goal. Climbing up the ladder will get even more difficult as the top 9 are serious runners. Well, it helps that I'm training for a marathon, as I'm building on my weekly miles by over the recommended 10%. based on the 5K race I ran on Oct. 7th, the Soroptimist Takbo Breast Friends. 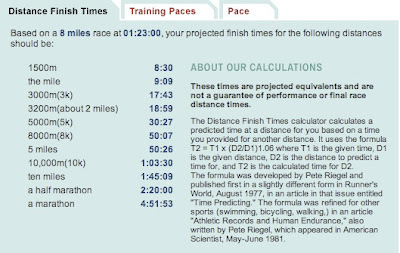 Calculations taken from the McMillanRunning.com site. Based on this calculation, it predicts that I will finish the Pasig Marathon in 5:12:17. Huh, so much for finishing under 4hrs! I slept over my sister's place last night. I don't mind because I get to see her kids and that means I get to run around her village in peace... no distractions, no need to give way to motor vehicles, no queueing up for the treadmill. So, early this morning, I headed out the door and ran around the village. In the rain. How liberating. I felt like a kid let out for the first time enjoying raindrops on my face. I continued on. So what if I get sick, there's no way I'll DNF this run! 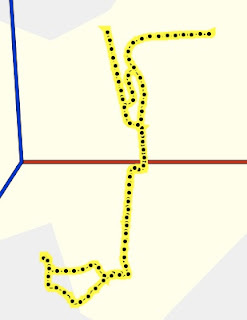 This road is mine. MON: Strength training, 1hr. Yoga, 1.5hrs. I woke up yesterday, weighed myself, wow, 121lbs!!! How can that be, I've been consciously eating mounds of rice and anything and whatever comes my way?!? I planned to start my early run before 6am, but I woke up at 6:05am :-( After a quick application of sunblock, attaching various gadgets on self and wolfing a banana, I was out the door by 6:20am. 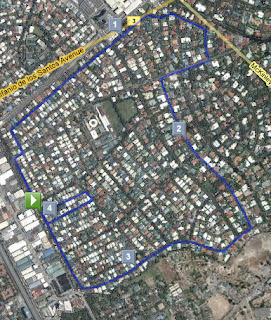 ROUTE: One round around UAP, I saw about 5 joggers out there, yey, I'm not alone. 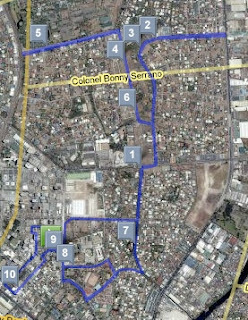 Then ran through Tektite, ADB, Topaz, Ruby, Emerald (a mini food carinderia market going on), Garnet, Sapphire, then down to Julia Vargas, through Rodriguez-Lanuza, up St Martin, around Ultra, then back home. All in all, a total of 5.51miles at a very slow pace of 11:27/mi. So. Yesterday, after reading The Bull Runner's blog, I am inspired to run the Pasig Marathon. Huh, I've only run one race so far, Soroptomists Takbo Breast Friend, a 5K, earlier this month. I ran slower than hoped, 32:03, but I placed 6th in Women's. Oh, the smile pasted on my face that day! I swear, the afterglow lingered for days. 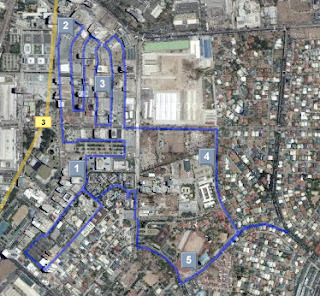 Whatever possessed me, but I am committed to running the Pasig Marathon this coming February 2008. Here starts my four month journey towards my first marathon.